Home > Eye Infections > What is Trachomatis? Trachomatis describes a type of Chlamydia, a bacterium that commonly causes a sexually transmitted infection in men and women. Chlamydia infection may cause no symptoms but does lead to complications such as pelvic inflammatory disease and infertility. As a sexually transmitted infection, it is less well known than other bacteria such as Neisseria gonorrhoea and few people realise that it is also the leading cause of preventable blindness in developing countries. Trachoma, the eye infection caused by Chlamydia trachomatis, puts the sight of 146 million people at risk worldwide. It is not a problem in the UK, as the eye infection is passed from person to person in tropical climates far more easily, through close personal contact and via flies and other insects. The World Health Organisation estimates that around 5 million people are currently blind because of trachoma, and a further 100 million people have severe visual impairment as a result of contracting the infection. The bacteria infect the conjunctiva of the eyes, the thin membranes that are inside the eyelids and the cornea that protects the front of the eyeball. The bacteria are able to enter the cells of the mucous membrane and carry on growing inside them. This means that the body’s immune system is unable to deal with the bacteria very effectively, but the area becomes very red and inflamed. As the infection progresses, the eyelids become so swollen and sore that the eyelashes start to turn inwards. Every time the affected person blinks, the eyelashes scrape away at the cornea, which is also inflamed, causing further damage. Eventually, the damage is so great that vision is damaged beyond repair. Trachoma is the world’s most common cause of blindness that can be prevented – and prevented relatively easily. All that is needed is to treat the infection in its early stages. The problem is that the antibiotics needed to do this are not always easily available in developing countries. People contract the infection and then remain untreated for weeks and months. Once the infection has progressed past a certain stage, antibiotic treatment can rid the body of the Chlamydia bacteria, but has no impact on the damage to the cornea, which often becomes ulcerated and cloudy. The inward turning lashes are also still able to cause further trauma to the front of the eye. 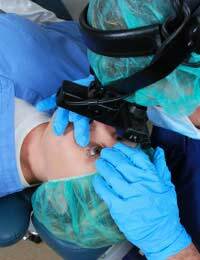 The only treatment in these advanced cases is surgery to turn the lashes away from the eye again, so that the cornea can start to heal. Even this may not completely restore sight, as the damaged cornea can lead to image distortion. Surgery to replace the cornea and the lens can help, but this is usually way beyond the resources in most developing countries. The most cost effective way to reduce the cases of eye infection and blindness due to Chlamydia trachomatis infection is to prevent infection passing from person to person in the first place. The World Health Organisation has recommended something called the SAFE strategy to help with this. Surgery (using funds from international aid) is used to treat the worst cases of advanced trachomatis, to save the sight of as many people in the community as possible. Antibiotics, donated by leading pharmaceutical companies such as Pfizer, are used to treat active infection and to be given out to whole communities when the prevalence of eye infection in children goes past 10%. Facial cleanliness is encouraged, to make sure that the eyes are kept clean, and there is less chance of the bacteria spreading through touch. Finally, there is pressure to bring about environmental change, to make supplies of clean water safe and to improve sanitation, all of which decrease the level of Chlamydia trachomatis in the environment.